Is your family bathroom looking a little worse for wear? Or are you perhaps renovating your entire house or flat and trying to find the best bathroom fitter company in your area? Then look no further than Stile IT; your number one choice for fitted bathrooms in Southampton. Our team of professional and highly trained bathroom fitters have years of experience in creating dream bathrooms for people, no matter what the size or shape of the given space. Our team will visit your home and work with you to create a fitted bathroom design that once installed, you will want to show off to all your friends and family. If you are getting on in age, or have a mobility issue, having a wet room fitted in your bathroom is a clever solution. Wet rooms are ideal for retaining your independence, as you will be less likely to rely on other people to help you in and out of the bath or shower. At Stile IT, we offer a selection of different bath and shower types that have special walk-in and easy access features, so you won’t need to climb over awkward parts in order to bathe. Wet rooms aren’t just limited to helping people who need innovative products to provide a little extra support. Wet rooms are also incredibly stylish and are signs of a very modern bathroom. As wet rooms tend to be open plan, they are ideal for small bathroom spaces, as all the excess materials are stripped away. Wet rooms have a gently sloping floor that leads towards the plugs, so you don’t need to install a shower base or wall panels, you merely just let the water flow away. An open plan shower allows for the extra luxury of installing a waterproof sitting area, such a beautiful granite or marble bench, so you can sit down while you bathe. Adding underfloor heating to a wet room provides that warm comfort we all crave, while the shower is both on and off. At Stile, there is not a part of designing and fitting a bathroom that we don’t cover. Our company has been in operation for over 15 years, and in this time, we are refined our techniques and skills so we are Southampton’s number one choice for fitted bathrooms and wet rooms. Stile IT only use the very best materials, highly skilled tradesmen and tools to design and install your fitted bathrooms. Our team are so confident in the exceptional level of work we deliver, that we provide every client with a two year workmanship guarantee on all completed projects, along with a five year product guarantee. To see images of the Southampton homes we have transformed with our fitted bathrooms and wet rooms, view our gallery. 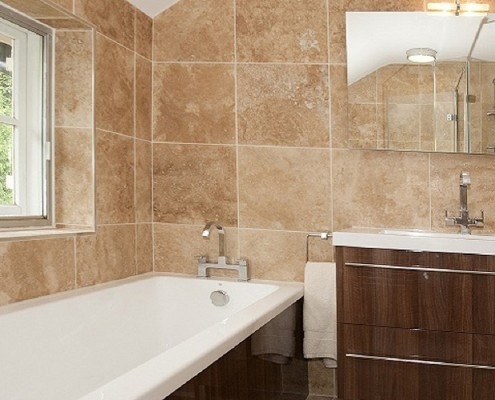 Whether you are a new build developer and want multiple beautiful fitted bathrooms in Southampton, or you are a home owner and want to renovate your existing shower room into a wet room, contact Stile IT. Speak to a member of our team today on 02380 633966 and lets begin the process of helping you fall back in love with your bathroom.